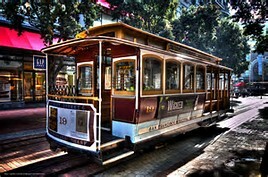 San Franciscans and tourists alike love the city’s iconic cable cars. They are indeed one of San Francisco’s unique treasures. In fact these cars are one of only two National Historic Landmarks that move. The other is the St. Charles streetcar line in New Orleans. The San Francisco cable car system is the oldest and largest system in permanent operation and the only one to still operate in the traditional manner with manually operated cars running in street traffic. Furthermore, the cable cars’ continued operation of service is locked into San Francisco’s City Charter. Here’s how it happened. Hallidie’s father, a British inventor owned a patent for a wire rope cable. Hallidie used this wire cable to design a conveyance system for hauling ore from mines. When he immigrated to the united states in 1852 during the Gold Rush he noticed horses and carriages had a tough time getting up and down San Francisco hills. He decided to build on his earlier design to solve the problem. He conceived the idea for a steam engine-powered, cable-driven rail system in 1869. Hallidie began construction of a cable line on Clay Street in May of 1873. The Clay Street Hill Railroad began public service in September of 1873. San Francisco added more cable car lines and by 1889 there were eight different lines. By the end of the 19th century there were 53 miles of cable car tracks woven throughout the city. Hallidie’s cable car system survived the great San Francisco earthquake of 1906, two World Wars, political attempts to have the cars removed in the ‘40s and ‘50s, and became the worldwide symbol of San Francisco that it is today. There are three lines running today: the Powell/Hyde line, the California line and the Powell/Mason line. The oldest line still in operation and the only one to run east to west is the California line. It runs up and down the steep hill of California Street from Nob Hill to the Financial District. The Powell/Mason line runs from Union Square to Fishermans Wharf past North Beach. It stops right in front of the Cable Car Museum, a “don’t miss” site for cable car buffs. The Powell/Hyde line begins at Powell and Market Streets This is the favorite line of Lysi Weston, the main character in my new novel, Murder Lurks in the Fog. This line passes Lombard Street, the crookedest street in the world, and provides amazing views of the bay. The line ends at Fishermans Wharf and Ghirardelli Square. 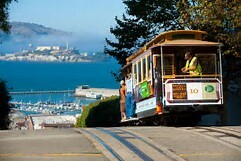 You can purchase a one-time ride ticket on board the cable car or a seven-day San Francisco CityPass. When you come to San Francisco, wear flowers in your hair and ride the cable cars. A Bushman in San Francisco?